Chevrolet India has been serving the Indian consumers with its internationally acclaimed stylish, comfortable and affordable cars for quite some time now. Chevrolet Tavera, Chevrolet Beat, and Chevrolet Sparkx are some of the few names that pop up in our minds when we talk about Chevrolet's presence on Indian soil. 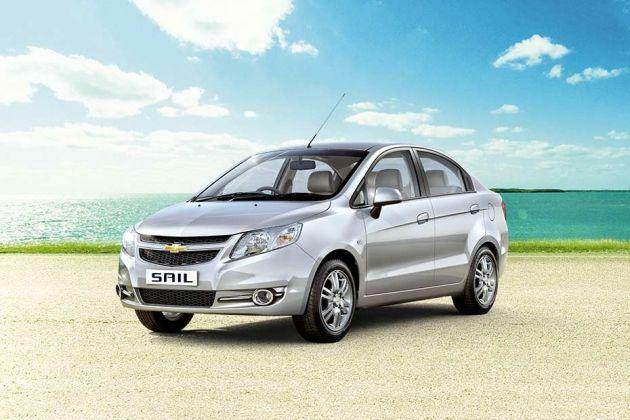 Chevrolet Sail is one such sedan, which the company recently added to its line up in India. This new sedan is developed on the existing Chevrolet Sail U-VA hatchback and is available in eight different trims which include four petrol based and four diesel based engines. This new range of entry level sedan by Chevrolet has been priced at an affordable base price of Rs 4.99 lakh(ex-showroom, Delhi), for taking on the likes of Maruti Suzuki Swift Dzire, Toyota Etios, and Tata Indigo. Chevrolet Sail 1.2 LT ABS is the top end variant in the petrol model lineup and it is priced at Rs 7.52 lakh(ex-showroom, Delhi) . This sedan features the top class safety feature of Anti-lock Braking System(ABS) for pulling up a large chunk of buyers towards it. Chevrolet Sail 1.2 LT ABS symbolises the hallmark bold character and creativity of Chevrolet cars. Chevrolet has brought a sedan which is a combined package of muscular and bold looks, stylish yet classy aura and is loaded with some of the best-in-class safety features. The exteriors of Chevrolet Sail 1.2 LT ABS are cladded with decent looks along with bold characteristics which makes it stand out from its competitors. The front facade of Chevrolet Sail 1.2 LT ABS poses a combative and masculine styling based on the Dynamic Sculpture Design. Its Hawk Wing style headlamps are separated by a honeycomb grille which is split by a single slat into two sections. This slat adds an aggressive stance to the front fascia and houses the signature logo of Chevrolet. The Hawk-Wing style front headlamps add an imposingly fashionable and elegant impact to the bold front styling. The fog lamps are placed perfectly on the body coloured front bumper and are separated by a honeycomb air dam. This body coloured front bumper brings an overall uniformity to the macho and muscular looks on the front facade. Chevrolet Sail 1.2 LT ABS pictures exuberant bold character lines on the side profiles, which are carved out with perfection. The side profiles of this sedan are greeted by a dual tone set of side mirrors which play an important role in forming up sleek and stylish looks along with sporty 8-spoke, 145-inch alloy wheels . Moving on to the rear, you will find that Chevrolet designers have left no stone unturned towards carving out the same bold and stylish looks which they brought up on the front. The flaming red tail lights are laid perfectly across a very large rear boot space and give an impressive and applauding rear view to the car. Special character lines flow though them and submerge into the fine metal body of the boot. Also, the rear body coloured bumper is one of the special visual charms of this car. Chevrolet Sail 1.2 LT ABS features the Chevrolet Corvette inspired dual-cockpit design which is one of the various salient features. When you step inside the Sail sedan, you are greeted by a wide array of impeccable features which Chevrolet has brought up for giving a harmonious appearance and feel to the passengers along with luxury and lavish comfort. The wonderful interiors consist of an airy and a big cabin. The 'wide horizon view' dashboard design is an additional charming feature. The sleek dashboard comprises of a 'rising sun' inspired stylish information cluster panel. For increasing up the comfort level for the drivers the car is equipped with a tilt steering, which can be adjusted as per the needs of the driver. But, it is the dual-tone compatible interiors which give a pleasant feeling and blend in perfectly with the graceful dashboard. The ample storage space in the front cabin serve their job of enhancing the overall interior comfort level. Under the hood, Sail is armed with an advanced and superior technology. It is powered by a 1.2-litre DOHC SMARTECH petrol engine, which houses 4 cylinders and an efficient MPFI fuel supply system . This engine has got a displacement of 1199cc and can easily generate a whooping 84.28bhp of power at 6000 rpm along with a peak torque amount of 113Nm at 5000 rpm. This powerful engine is mated with an adept 5-speed manual transmission system . The company boldly claims that this SMARTECH petrol engine works perfectly with the proficient 5-speed gear box for putting up an impressive fuel varian of 18.2 kmpl . This latest entrant out of the camp Chevrolet, comes with a top class braking system, which comprises of disc brakes on the front axle and drum brakes on the rear. Along with this set of sound braking system, an advanced suspension system gives a comfortable and impressive driving experience. The front suspension consists of McPherson struts and a torsion beam axle forms up the rear suspension unit. While, passive twin-tube gas filled shock absorbers are deployed for absorbing the shocks at both the front and rear ends. On top of this, the sedan is blessed with a power steering wheel for making the handling of the Sail very easy and hassle free for the driver on all kinds of terrain and especially on crowded city routes. Chevrolet Sail 1.2 LT ABS embodies fine class comfort level for the passengers. The car is blessed with ample leg room, which would cheer up the passengers as they can stretch out and sit comfortably. It comes with luxurious comfort and convenient ergariaic surprise. The car offers comfortable and plushy seats, foldable and stylish rear armrest and ample of leg space on the front and rear. Other impeccable features include Bluetooth-enabled audio streaming, speed-sensitive auto locks, tropicalised air conditioning system, superior boot space , and storage space under the rear seat. Special attention has been laid on this top-end petrol variant for equipping with sound safety features. As the name suggests, Chevrolet Sail 1.2 LT ABS is equipped with a Anti-lock Braking System along with the EBD for retaining the steering control on the track while emergency braking system is deployed. Along with this the car gets a Safe-Cage design with a 3-point force dispersion structure which gives extra safety to the cabin. Dual airbags have been added for the protection of front seat occupants during high speed frontal impact. An engine immobiliser with remote key-less central door locking doubles up the security of your car and child protection rear door locks stop the accidental opening of the doors. The 18.2 kmpl mileage figure could have been a little better along with addition of more salient features which could make this latest sedan a segment leader. Chevrolet Sail is available in 6 different colours - Linen Beige, Caviar Black, Switch Blade Silver, Velvet Red, Summit White, Sand Drift Grey.